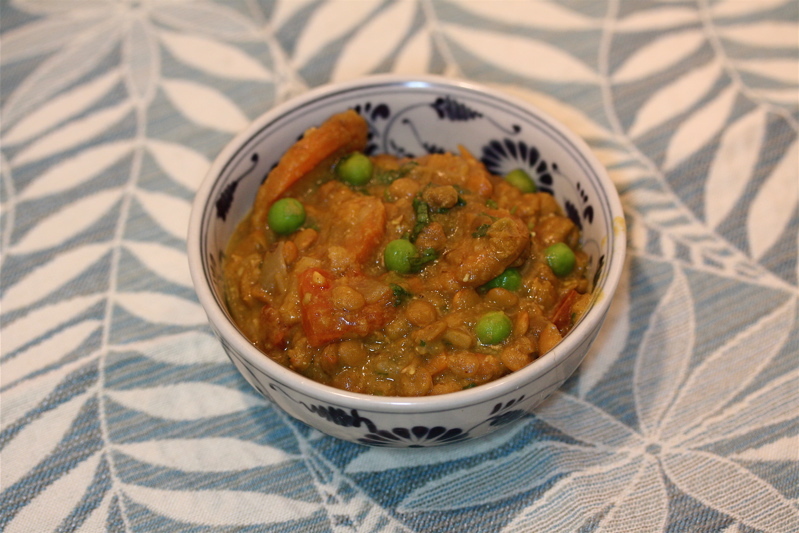 Another lick-the-bottom-of-the-bowl winner from last month’s supper club was David Landrum’s Coconut Red Lentil Soup, which he got from Bon Appétit Magazine. We couldn’t find a good link, so here are the instructions below. Thank you, David! P.S. This isn’t a photo of the soup, but one like it. Discerning readers will see that David’s recipe has no peas. Add them if you want. Heat the tablespoon of olive oil in a dutch oven or large soup pan and add the onions, bell pepper and jalapeno and cook for 5-7 minutes until the vegetables have softened and start to take on some color. Add the garlic, ginger, spices and tomato paste and continue to cook for 2-3 more minutes until the mixture is toasty and fragrant. Add the water, coconut milk, lentils and chickpeas and cook uncovered for 20 to 25 minutes adding the lime juice at the end of cooking. Taste and adjust with more salt or more lime juice if desired. Serve the soup topped with a sprinkling of fresh cilantro and some extra limes on the side. I wonder if there is a substitute for the coconut milk?